Cambridge City Hall is located at 795 Massachusetts Avenue, Cambridge, MA 02139; phone: 617-349-4300. Photo: Longfellow House, National Historic Site, ca. 1759, 105 Brattle Street, Cambridge, MA. Photographed by User:Daderot (own work), 2005, [cc-by-3.0 (creativecommons.org/licenses/by/3.0)], via Wikimedia Commons, accessed February, 2014. Cambridge, or Newtowne as it was first called, was intended to be the capital of the Massachusetts Bay Colony, the residence of its governor and his assistants, and the seat of the General Court. The site was chosen because of several advantages. It was accessible to ocean-going vessels, and yet protected from assault by land and sea. It had an ample supply of drinking water, good agricultural land, and was located within reach of the other Massachusetts Bay plantations. The site chosen in 1630 for the capital was on the north bank of the Charles River, five miles upstream from Boston, on a small hill that was the first protected high ground upstream from the Back Bay of Boston. The original settlement was just south of present-day Harvard Square. The town was composed of a system of streets which were laid out on a somewhat irregular grid. The grid was superimposed across a low hill rising above the tidal marsh. A market place was established on the crown of the hill. As originally laid out, the town contained 64 house lots ranging in size from 1/8 to 3/4 of an acre. The original street pattern and width are still existent in South, Winthrop and Holyoke Streets, and reflect the character of the early period. 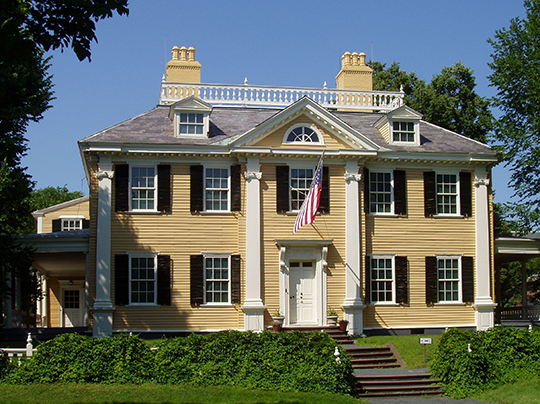 The early character of Cambridge is illustrated by several vernacular structures, including the John Hicks House, 64 Boylston Street, and 106 Winthrop Street, an early tenant house which adjoins an early eighteenth century retaining wall. This wall, built of Roxbury puddingstone, probably brought from Mission Hill, illustrates both the original topography of Newtowne's hilltop site before the filling of Eliot Street and the absence of local building stone. In 1630 a series of stockades was put up around the village, since it was assumed that if any of the neighboring plantations was attacked, the inhabitants would take refuge in Newtowne, the capital. The fortification of "Pallysadoe" was constructed of stakes, willows, and a trench, and extended in an arc from the foot of Ash Street to the junction of Oxford and Jarvis Streets, and possibly beyond. In 1632 a second line, the Common Pales, was constructed along the east side of the community, from the corner of Mt. Auburn and Linden Streets to the Charlestown (now Somerville) line near East Cambridge. In 1636 another line of pales was built along present-day Linnaean Street, indicating that the Cow Common inside the first palisade had proved too small. By 1636 gates were set up where the principal roads intersected these defenses. It seems likely that gates were intended not to keep out hostile persons, but to prevent cattle from straying or wild animals from trampling the crops or preying upon the cattle. Within two decades the issue of defense had been entirely forgotten, because English ships had not threatened the colony, and because the Indians had proved friendly. Visible remnants of this fortification system survived until the twentieth century near Ash and Oxford Streets. Newtowne's nearest neighbors were Charlestown, four miles to the east, and Watertown, one mile to the west. Roxbury, six miles to the south, and Boston, two miles further, were reached by a road through Brighton and Brookline, present-day Harvard Street. Other early highways included the "Highway to the Neck" (modern Bow and Arrow Streets) leading to the first cultivated fields on Dana Hill and to hayfields near Central Square, and paths which branched off to the oyster banks and Pelham's Island. Thus, Cambridge was the hub of a system of trails and river routes whose location was determined by the terrain, skirting boggy areas and marshes. In 1632 Newtowne consisted of one thousand acres enclosed by the Palisade and Common Pales (from Ash Street to East Cambridge, and from the Charles River to a line from Widener Library to Inman Square). Between 1632 and 1636 additional land was granted to Cambridge, including Brighton, Newton, Arlington, Lexington, and parts of Lincoln and Bedford. A final grant extended the boundaries to the Merrimack River. At that point, Cambridge extended some thirty-six miles from Billerica to Newton, in the form of an irregular "Y" that was only one mile wide at Harvard Square. Soon after these limits were attained, outlying settlements began breaking off to form separate communities. Farmers who settled Shawshine in 1652 separated as Billerica in 1655; Cambridge Village (formerly called Southside) became Newton in 1688; Cambridge Farms became the town of Lexington in 1713; and Menotomy (long called West Cambridge) became the town of Arlington in 1807, the same year that Little Cambridge became the town of Brighton. For a short time a rivalry existed between Cambridge and Boston. Due to its geographic and commercial advantages the seat of government was shifted from Newtowne to Boston in 1631, followed by the General Court in 1638. 1638 was also the year the community's name was changed from Newtowne to Cambridge. The founding of Harvard College in 1636 kept Newtowne from becoming a quiet farming community. The college was established by a grant from the General Court and a legacy from John Harvard, an English minister living in Charlestown. From its earliest days, Harvard has constituted the vital core of the community both culturally and topographically. The original campus is contained within the Harvard Yard District and the district's extension. The oldest structure that remains is Massachusetts Hall (1718), the fifth major building erected by the college. This simple Federal style building formed a small quadrangle with the second Harvard Hall and Old Stoughton Hall. In the 1640s a change occurred in the method of land ownership. Rather than each settler owning his planting fields, a process of consolidation of small holdings under a few landowners set in. This was made possible by the sharp drop in land values following the severe economic conditions in 1640. Edward Goffe, for example, bought all the "Planting Fields," and Herbert Pelham bought several of the "Great Lots" which later became the Inman estate. Atherton Hough created a 260-acre farm later known as "Lechmere's Point." With fewer people controlling the land, the remaining townspeople earned a living as tradesmen and craftsmen, or relocated in more distant areas. By 1670 the physical appearance of Cambridge had changed considerably and was taking on the form it would keep for the next two and one-half centuries. Several public buildings had been erected: a meetinghouse in 1650, a schoolhouse in 1669, a parsonage in 1670 and a new hall for Harvard College (1672-77). Among the civic improvements made were the "Great Bridge" across the Charles River. Built in 1660-62 at Boylston Street, it provided access to Boston via Roxbury. On the eve of the Revolution the Puritan and Tory societies living side by side in Cambridge presented an interesting contrast. In place of the homogeneous population of the seventeenth century, Cambridge in 1770 had become separated into two distinct groups, Puritan and Anglican. The Puritan descendants of the early settlers constituted more than 90% of the population, and were farmers, artisans and tradesmen. When the Revolution broke out, they opposed the Crown. A factor of utmost importance in the development of Cambridge was the construction of the two bridges across the Charles River: the West Boston Bridge (1793) where the present-day Longfellow Bridge stands, and the Canal or Craigie's Bridge (1809) on the site of the Charles River Dam. The bridges dramatically changed the orientation of Cambridge and sparked the city's growth as a commercial and industrial center. The West Boston Bridge shortened the distance between Old Cambridge and Boston from eight to three miles, and opened a direct route along Massachusetts Avenue and Main Street, which ran through Cambridge from the agricultural interior of Middlesex County to the markets of Boston. Until this time travel between Boston and Cambridge had to follow one of two circuitous routes: by the ferry from Copp's Hill to Charlestown, or by the road over Boston Neck, across Muddy River at Brookline Village, through Little Cambridge (Brighton) and into Old Cambridge at the Great Bridge. In 1805 Congress designated Cambridge as a port of delivery, thus stimulating real estate speculation. Rufus Davenport and Royal Makepeace assembled large tracts of land around the causeway through the marsh surrounding the bridge head to higher ground near the haymarket in present-day Central Square. With three other landowners they incorporated as the Cambridgeport Proprietors and commenced the filling of the marshes, and laid out a network of canals and a street and building pattern oriented toward the canals. Lots were first sold in 1805-06, with restrictions that buildings should be at least three stories high and built of brick or stone. Soon stores and taverns flourished along the new roads leading in from the country — Broadway, Hampshire Street, Massachusetts Avenue and Main Street. South Row (1806), an early commercial block in the Federal style, is a reminder of this period in Central Square. The eastern part of Harvard Street was laid out in 1804, and its extension to Old Cambridge followed in 1808. All these routes converged on the West Boston Bridge, and became the backbone of the Cambridge street system. In 1809 Cambridge Street was put through to connect the Canal Bridge in East Cambridge with Harvard Square. River Street connected the River Street Bridge of 1811 with Central Square. These bridge-oriented transportation routes are still major arteries today. The flourishing community in Cambridgeport required a meetinghouse, and consequently the Cambridgeport Meetinghouse Corporation was formed. A public square of 11 acres was set aside at Columbia and Harvard Streets, and on it a large brick meetinghouse was built which stood until 1853. This square was envisioned as the main axis of the city by the Proprietors. Cambridgeport came legally into existence in 1808 by an act of incorporation. Already, however, the Embargo of 1807-09 had gone into effect. Land values plummeted and commercial ventures faltered. When the War of 1812 ended in 1815, any hope for Cambridgeport as a port and great commercial city were lost. Instead, the manufacturing center of East Cambridge would become dominant. Some of the canals that had been built for coastal shipping were filled, and much of the land was left empty and undeveloped. Although shops along the main street were still active, Cambridgeport was left with an economic base dependent on highway traffic, suburban development, and a few scattered tanneries and soap works. Between 1820 and 1830 the population of Cambridge swelled, and by 1845 there were 12,500 residents. One of the city's major problems was providing housing for the 1,000 new residents who were arriving annually from the depressed farmlands in Western Massachusetts, Northern New England, and Eastern Canada. This influx of labor launched the city's growth as a commercial and industrial center. Starting in the 1830s, the immigration of farmers, artisans and mill-workers from the British Isles and Germany began to supply the labor pool for industry. Cambridge, because of its proximity to Boston, its abundant venture capital, its large labor pool, and its nearness to the major railroad terminals of Boston, played a prominent role in the industrial revolution in America. During the 1830s and 1840s the brick-making industry became established in Cambridge as the demand for this building and paving material increased. Two houses of the Sands family (CPT.II.C.5 and NR) and the Wyeth Brickyard Superintendent's house (c.1848) (NWC.II. C.9) are relics of this industry, begun in East Cambridge, moved to Putnam Avenue, and eventually centered in North Cambridge. The glacial clay which lay beneath the Great Swamp near Alewife Brook had been used to make bricks since the Colonial period. Industrial development of the claylands eventually included a complex of brickyards, drying kilns and clay pits extending from Vassal Lane and Walden Street to Rindge Avenue and Alewife Brook. Local farmers sold their land to brickmakers who in turn hired laborers to extract the clay from the pits. The clay was exhausted by the mid-twentieth century, at which time the brickyards were abandoned, and the pits flooded or filled. Cambridge was linked to Boston by means of horse-drawn vehicles via the oldest and most important corridor of transportation, the Massachusetts Avenue-Main Street-West Boston (now Longfellow) Bridge axis (the present route of the subway). The earliest public transportation over this route was a daily stage established in 1795. In 1826 hourly runs took place, the first high-frequency transit route in America. In the mid-1830s the stagecoaches were replaced by large-capacity omnibuses. In the 1840s and 1850s more omnibus lines were added, feeding traffic to Harvard Square, where passengers transferred to the Boston omnibus. Dwellings sprang up along these lines of communication and along the nearby cross streets, occupied by people employed in Boston, who could now commute to their jobs easily. Large middle class suburbs of professionals, merchants and white collar workers were created in this way. In 1873 Old Cambridge consisted of built-up neighborhoods which tapered off to fields and marshes. There was little building west of Fayerweather Street or north of the ridge on Reservoir Hill. Exceptions are the W. A. Mason farmhouse (1846) and the Hooper-Eliot house (1872). The northwestern outpost was a group of small houses around Observatory Hill, while a series of widely spaced mansions stretched along Massachusetts Avenue to Porter Square. Included in the latter group are the Alpheus Mead House (1867), Daniel Snow House (1868), the Charles Hicks Saunders House (1862-63), the D. Gilbert Dexter House (1875), and the Alden T. Keen House (1876). Harvard Square and the Common were the heart of the community, and the most striking building on the Cambridge skyline at this date was Memorial Hall (1866-77)(NR), designed by the firm Ware & Van Brunt in the Ruskinian Revival style. Also by 1873 the college had begun to turn away from the Common and the Square, and to create a center of its own in Harvard Yard. This was also the time of the construction of the Peabody Museum (1876), and a number of the buildings in the North Yard, including Austin Hall (1881)(NR), a part of the Law School designed in the Romanesque Revival style by architect H.H. Richardson. Activity in Brattle Square included the construction a bit later of Brattle Hall (1889) (OC.II.A.4), a social center, and theater. A controlling factor in the development of Cambridge throughout the nineteenth century until development eased in 1930 was the improvement in urban mass transportation which continually reduced the time-distance relationship with Boston, the metropolitan center. The opening of the West Boston Bridge in 1793 permanently altered the future of Cambridge, changing the community from an isolated county seat to economic dependency and eventually a suburb of Boston. The existence of tolls until 1848 inhibited suburbanization, but the development of an hourly stage in 1826 and omnibus routes on Main Street and Massachusetts Avenue in 1843 and on Broadway in 1852 opened Cambridgeport and Dana Hill to real estate development which featured large houses on open lots for businessmen and professionals who commuted to Boston. Each later improvement—horsecars in 1856, electrification of street railways in 1889, and the rapid transit subway in 1912—reduced the time and cost of travel to Boston and opened additional land for development. The integration of a metropolitan transit system also meant that Cambridge became an industrial center, drawing on a greater labor pool than the city alone could provide, and reduced the importance of Cambridge as an independent commercial and financial center. The functional specialization caused by efficient mass transit also meant that Cambridge would become a cultural center of the Boston area. The construction of the subway from Boston to Harvard Square caused the last great spurt of suburban development, as multi-story apartment houses were built in Central and Harvard Squares, along Harvard Street and Broadway, and around Cambridge Common. The subway completed the commercial dominance of Boston over Cambridge, and ensured that only local retail functions could exist there. The opening of the subway also dislocated earlier transportation patterns, as most suburban railroad stops were soon abandoned and the former through trolley routes to Boston were terminated at Harvard Square. This and the increase in land value caused by improved transportation meant that suburban development after World War I would be largely middle and working class in nature. Transportation improvements in the automobile era were largely directed at improving access to the developing outer suburbs of Belmont and Arlington, although the construction of Memorial Drive and Fresh Pond and Alewife Brook Parkways stimulated construction of the last major suburban development at Coolidge Hill and along Larch Road in the 1930s. Since that time, most construction had taken place as infill in residential neighborhoods and in the institutional precincts of Harvard University and the Massachusetts Institute of Technology.